When you’re exploring a new city or even a new country food is one of the most exciting parts. It’s something we may take for granted at home but once out of our everyday surroundings it’s something that can become somewhat of an adventure (be it good or bad) as you discover new tastes and smells. We all love to try and track down the latest trends, the different techniques, and of course new flavours. But what I think is the best part is learning about the culture that the food brings with it. Such an important part of the cuisine in any culture though quite often missed by the everyday tourist. Food is something that can change the dynamics of a place, from a simple family to the entire nation. Thats why I loved our Medellín Food Tour with Tasty Town where we not only got to try some tasty treats but also learn of the culture of Colombia and how it’s food intertwine. 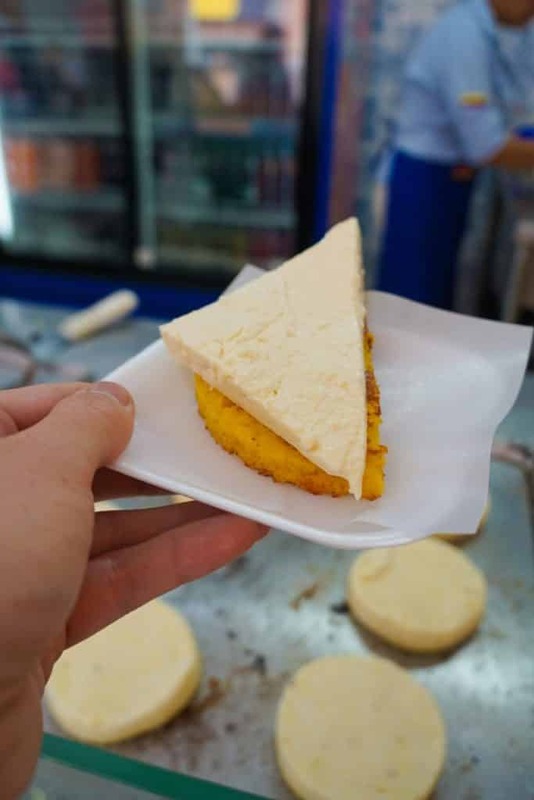 Our Medellín Food Tour, lead by local foodie Laura, started in the nearby Envigado, a local area away from the busy Medellín centre and technically another city all together. 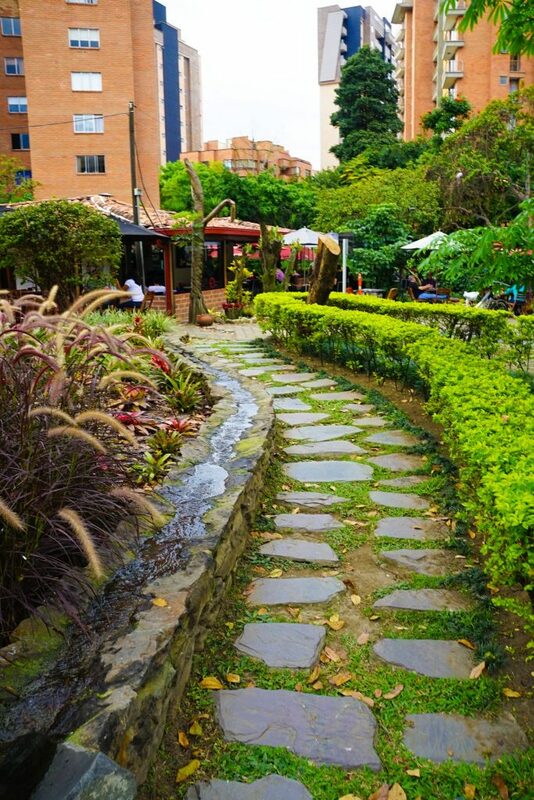 It may seem counter intuitive but this is the best place to experience the real food of Medellín because it’s not an area tourists often head to meaning there’s none of the many touristy restaurants aimed at them as you’ll see in Medellín’s centre. Our first stop was a small but busy bakery. A hustle of people outside and the smell of fresh baking inside. Pan de queso y Colombiana was what we were here for. Pan being bread and queso being cheese. 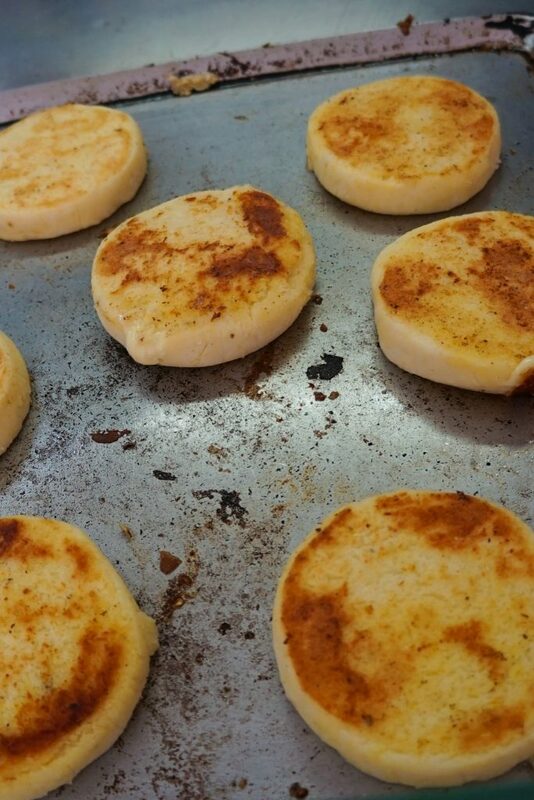 Think of something along the lines of a bagel mixed with a cheese scone. Arriving with the Spanish it was originally made with wheat. Discovering corn was the only thing growing in Colombia they simply switched the ingredients using the same recipe creating this Spanish and Indigenous fusion. A perfect breakfast in my opinion, especially when it’s still warm out of the oven, but as we were to find out not the breakfast of choice in Colombia. Next stop on our Medellín Food Tour was a stop at the local market. 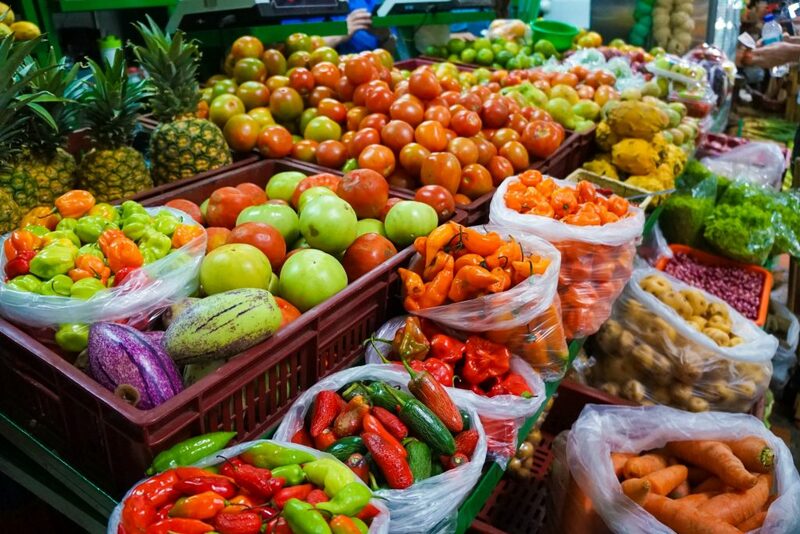 This market in Envigado has been operating in the same spot for over 400 years – how it’s not in the tourist books I have no idea, but that’s why you trust Tasty Town! 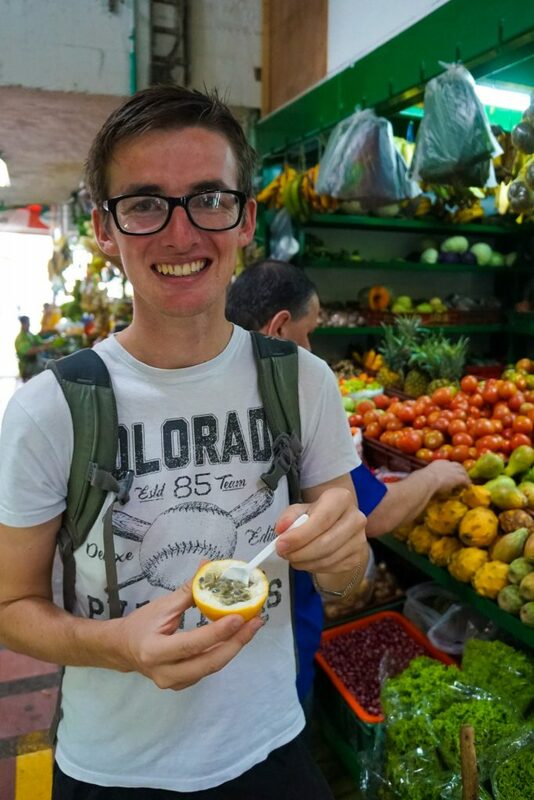 If you’ve spent any time in South America you’ll know how amazing these markets are. A place you can buy anything and everything, a local from every household will head there daily for one thing or another, they’re a central part of the community. We stopped at one of the many stands piled high with all sorts of fruit. Almost any tropical fruit you could think of. We tried Lulo, Granadilla, Pitaya, Higo, Ají pajarito and Murrapo! I bet you haven’t heard of any of them but I can tell you they were all absolutely delicious. 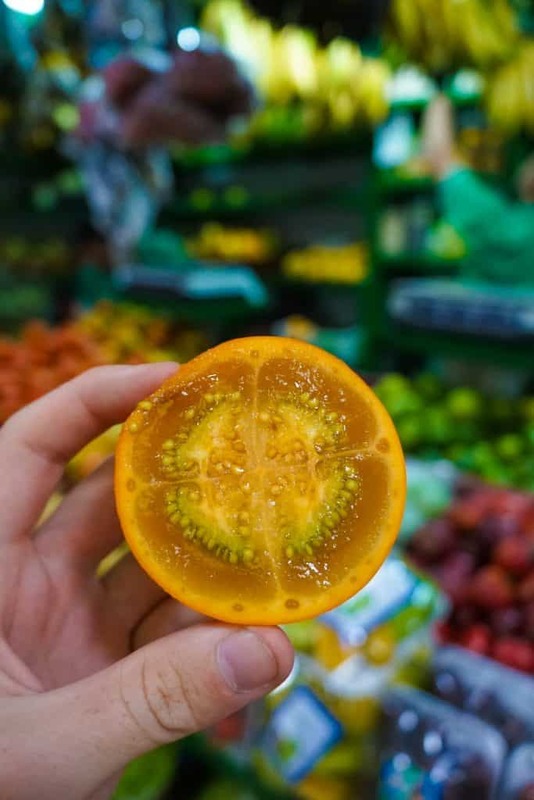 It was great because we’d been seeing all these weird fruit all across South America but hadn’t tried any because we didn’t want to hassle the guy only buying one of everything. But because of the relationship Tasty Town has cultivated in this area he was bringing out more fruit than we could possibly try! In the end we even bought some more to take with us because – well – you won’t find fruit this good at your local supermarket! everyone to gather, have a bite to eat and of course, a bit of a gossip. Out of the many types we tried empanadas de papa con ají. 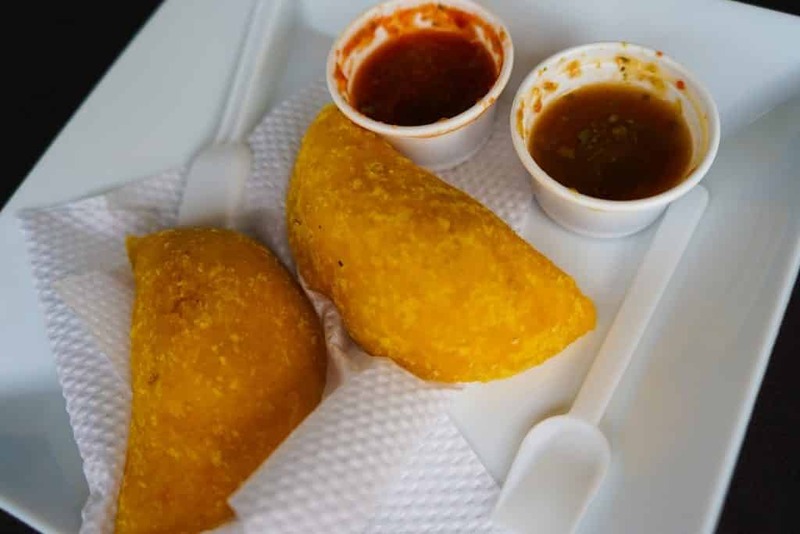 We’d had many an empanada on travels thus far but this little corn filled pouch of potato was probably the best so far. Seemed fitting as well seeing is Papa is also the Spanish word for Pope! All praise the Papas! At this point on our Medellín Food Tour we were feeling pretty full, but a short walk till the next stop and we were ready for lunch! 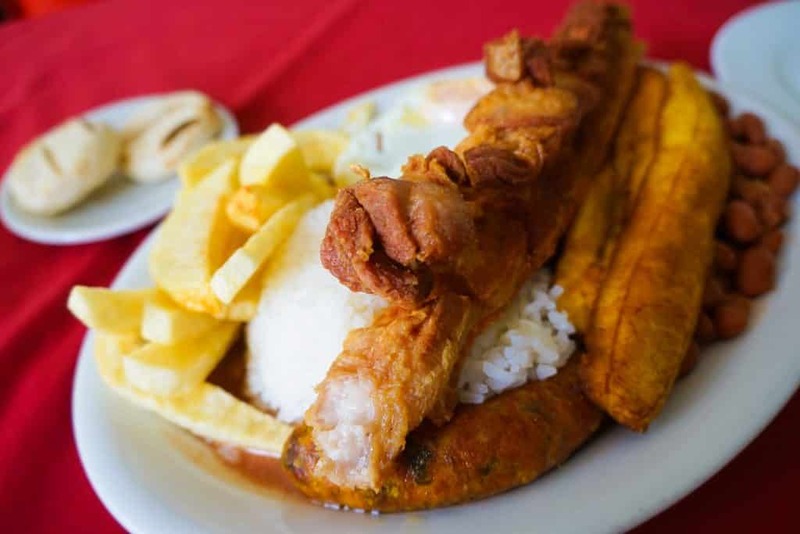 We’d heard about bandeja paisa from many people already, a dish named after the locals of the region (Paisas). It also has a reputation for being huge, and that’s exactly what it was! Now it was time for us to try it…. The dish includes Frijoles (black beans), arroz (rice), chicharrón (pork belly), chorizo, huevo (egg), tajada de maduro (fried plantain), carne en polvo (even more meat!) Now my number one tip for this dish is, Dont Eat Breakfast!!! Thankfully we were sharing or we would have never conquered it (still debatable who won I’ll be honest) but classic Colombian comfort food was true to form and filled with so many amazing flavours and cooked to perfection! As we stuffed a few more bites into our mouths, Laura, our terrific guide, told us it was time for dessert. So off we waddled with slightly horrified looks on our faces wondering if we could squeeze in anything else. 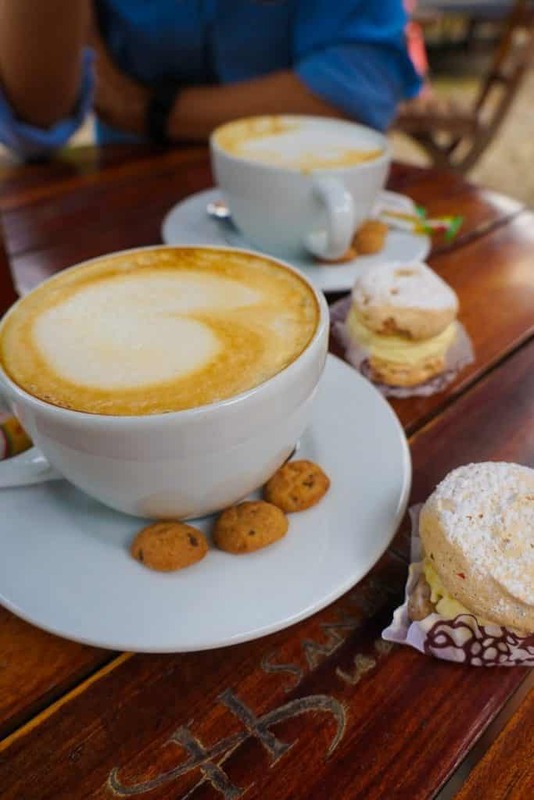 We stopped in at a small postre, or desert shop to pick up a local sweet surprise and headed to one of the cities best coffee shops for a post tour de-brief and to answer any other questions we had! Now was out chance to ask all about life in the city and for future food recommendations around the city, which were amazing!! Laura recommended Ganso y Castor (brunch), Alambique and OCI to us which were spot on – but since these are individually tailored to your tastes and interests I’m sure she will have some different ones for you! Overall our Tasty Town Street Food Walking Tour was one of the best experiences we had in Medellin, a intensely local experience with a highly qualified and friendly guide who intertwined humour and knowledge to give us insight into what everyday Colombians eat, while tempting us to step outside our comfort zone. Easily one of the best things to do in Medellin and I highly recommend you check it out! Thanks to Laura and Tasty Town for inviting us to come along on their Medellín Food Tour. They also offer a Colombian Coffee Farm Tour or Cooking Experience which I would love to try on a future visit! Private tours can also be arranged to any other specific interests you may have in this fast-changing city of gastronomy. As always the opinions expressed in this article are mine and mine alone.